Though pot was still legal as the 1970s dawned, Nixon cracked down on the drug. It is hard to be completely wrong, but this statement is up to the challenge. The federal government started turning the screws on marijuana before Nixon had even graduated law school. The sanctions got progressively tougher over time until the tide was reversed by…Richard Nixon. As President, Nixon dramatically reduced (yes, reduced) federal mandatory minimum penalties for marijuana possession from 2-10 years of hard time to 1 year with an option even for that sentence to be waived by a judge. Not incidentally, Nixonâ€™s drug czar was a physician and two thirds of the administrationâ€™s drug control spending went toward treatment. 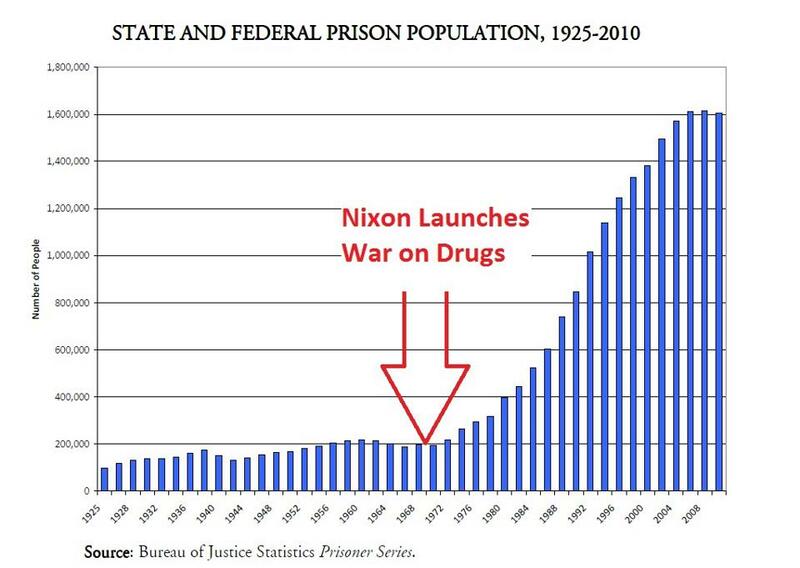 Nixon drug policy also frequently takes the rap for mass incarceration. Here is one of a number of charts that floats around the Internet and is used to support this claim. Reality I am afraid must intrude here as well (With added demerits to this chartâ€™s designer for deceptively using the number of prisoners rather than the incarceration rate as a metric). Since 1930, there has been only one stretch in U.S. history when the incarceration rate was below 100 per 100,000 people: Nixonâ€™s presidency. The incarceration rate didn’t begin to rise until after he left office, and it continued to do so under the next six presidents and 18 congresses, who should be held responsible for their own policy decisions. Richard Nixon broke the law, did lasting damage to our political culture and resigned in disgrace. That does not however mean that every complaint about current public policy can be laid without evidence at his feet. Megan McArdle related a funny Richard Nixon story last week, concerning his creation of a White House Palace Guard. The palace guard episode is silly at any level and also reveals something of Nixon’s character. Let me start off your August weekend with a similar anecdote. If you tunnel deep down under The West Wing, you will find a maze of poorly lit, unpainted hallways with exposed pipes and wires (no OSHA rules apply underneath The White House, apparently). 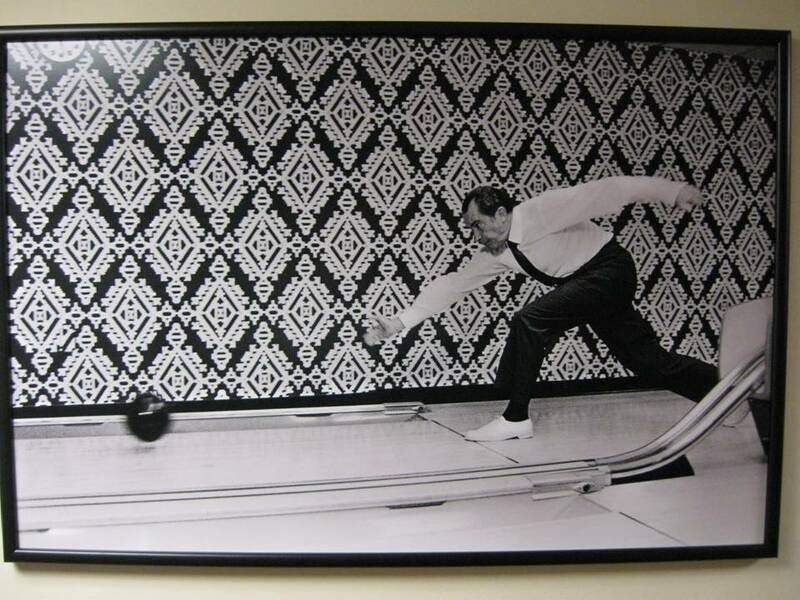 If you stumble about the labyrinth for awhile you will come to a nondescript door that, quite surprisingly, opens onto a two-lane bowling alley which was built for President Truman. 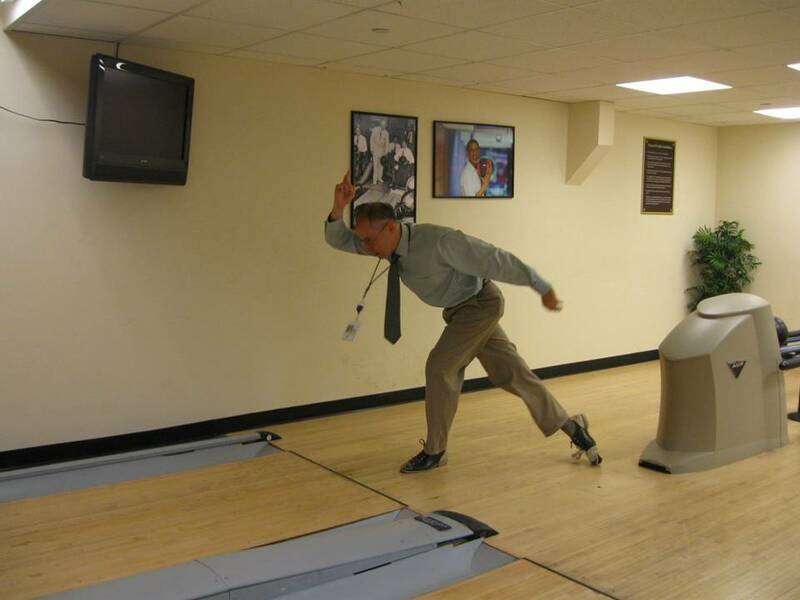 Here I am showing fantastic form therein. I bowled 300. It took me about 50 frames, but I did it. I can’t bowl at all really. But I am very good at looking like I know what I am doing when in fact I don’t — an essential Washington D.C. survival skill. Moving someone from heroin to methadone — that’s a wonderful move.